With a classic, friendly facade, the Springfield garage with apartment above offers flexible living and storage space galore. 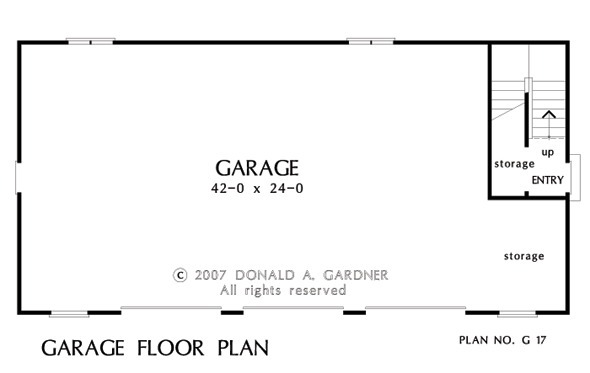 Downstairs you'll find three garage bays, plus an extra storage alcove. Upstairs is an efficient apartment layout that allows space for a home office or second bedroom, along with a kitchen, dining alcove, and balcony. 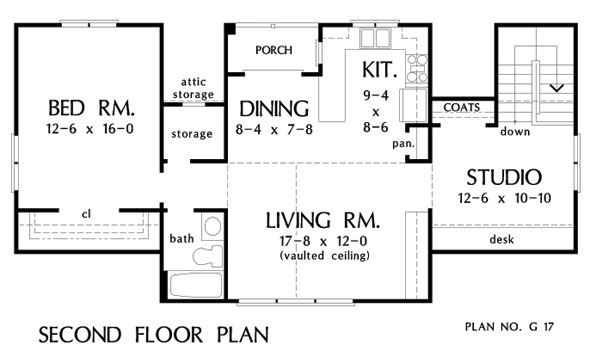 2nd Floor: 1047 Sq. Ft.
Other Storage: 52 Sq. Ft.
House Dimensions: 49' 8" x 24' 8"
Bedroom #1 : 12' 3" x 16' 0" x 8' 0"
Dining Room : 8' 4" x 7' 8" x 8' 0"
Garage : 42' 0" x 24' 0" x 0' 0"
Garage Storage : 7' 0" x 10' 0" x 0' 0"
Kitchen : 9' 4" x 8' 6" x 8' 0"
Living Room (Vaulted): 17' 8" x 12' 0" x 0' 0"
Other : 5' 4" x 4' 0" x 0' 0"
Porch - Rear : 8' 0" x 4' 4" x 8' 0"
Storage (1st Fl.) (Sloped): 6' 0" x 3' 0" x 0' 0"
Storage (2nd Fl.) (Sloped): 12' 6" x 3' 4" x 8' 0"
Studio : 12' 6" x 10' 10" x 8' 0"